While cats groom themselves, there are occasions whereby they may need a bath. This is especially the case if they end up with a sticky or greasy coat. Because of this, ever cat owner should make sure they have some cat shampoo handy for those moments when their pet makes an appearance and is way dirtier than usual. Plus, there are a number of other situations that may arise that may main you need to give your cat a bath, as we will discuss below. Read on to discover more about whether your cat needs baths, how to bathe your cat, and, of course, the best shampoo for doing so. 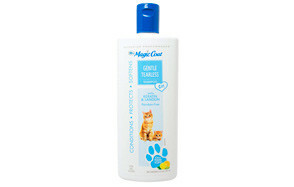 This shampoo is a great option if your cat has sensitive skin. This is because it contains aloe and natural oils, and is free from soap. It is made from all natural ingredients, so there are no harsh chemicals, sulphates, added colours, or alcohol. The product works well as a pet deodoriser, keeping your cat smelling fresh. It is also a popular choice amongst pets that have flea bite, grass, and food allergies, and de-tangles for easy brushing. 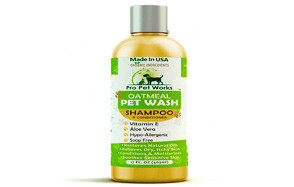 There are many reasons why this shampoo is a popular choice with pet owners. It is biodegradable and completely natural. It smells good, is cruelty free, and it is super gentle. 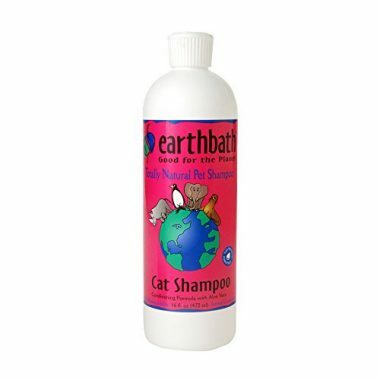 One of the great things about Earthbath All Natural Pet Shampoo is that you can choose from a number of different scents – from mango tango to vanilla and almond - so you can pick something that your cat likes. Yes, you did read that right; this is a waterless shampoo! So, if you have trouble bathing your cat because they hate water so much, this is the perfect product for you. It basically follows a similar concept to the dry shampoo that some of you reading this will use yourself. You simply put some of the product in your hands, massage your cat from head to toe, and the let him dry. You can either brush your cat or use a wipe to rub him down afterward. 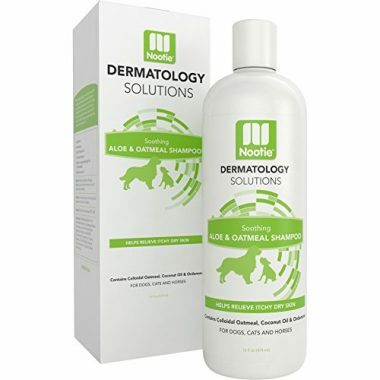 This product is made from all natural ingredients, including oatmeal, vitamin E, neem oil, and aloe vera. 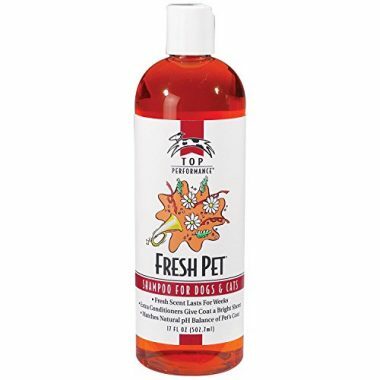 Top Performance Fresh Pet Shampoo can be bought in many different sizes, including a one-gallon jug, which is ideal for those who have lots of kittens. This shampoo is designed to prevent mats and tangles in cats. It offers a natural pH balance, which means it is safe for pet use. It also has a pleasing scent, which will last for a long time once you have finished bathing your cat. Next we have the Oatmeal Shampoo By Dermatology Solutions. Oatmeal is a popular ingredient in cat shampoos because it is safe and gentle. This product also features ordenone and coconut oil, which creates a fragrance that is mellow and pleasant for both you and your pet. Moreover, the added Aloe Vera gel helps to aid itchy skin if this is something your cat suffers with. You can also have the peace of mind that no harsh chemicals have been used in the product. This is another all-natural type of shampoo, which is gentle yet powerful enough to tackle grime and dirt. 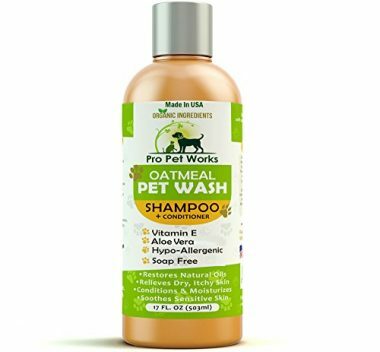 This shampoo has been designed to help your pet keep his healthy and natural oils, rather than stripping the scalp of them. You will notice that your cat’s coat shines, and this will only improve with every bath, as the roots of their hair get nourished. This product is non-toxic and 100% safe, as only natural ingredients are used. This includes the likes of honey extract, rosemary, chamomile, Aloe Vera, shea butter, and, of course, oatmeal. The ingredients all serve different yet important purposes. The shea butter will promote a healthy, full and thick coat. The Aloe Vera soothes irritation and itchiness while the oatmeal provides a natural anti-itch solution. 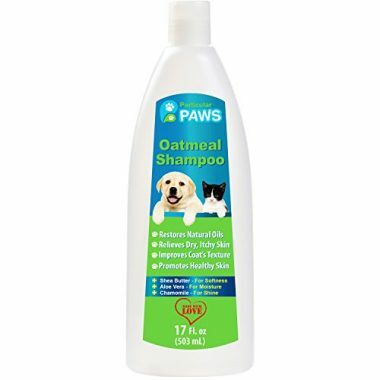 Mild and organic, this is another popular shampoo choice for cat owners, as well as dog owners too for that matter. It contains a refreshing mixture of organic ingredients, which not only clean and enhance your pet’s coat and skin, but protects it too. 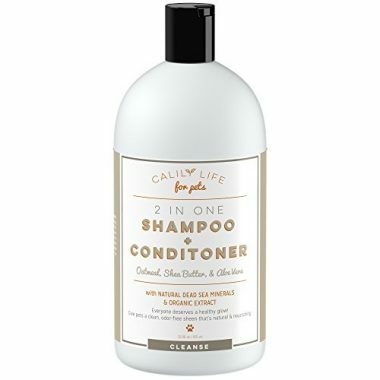 Like many other shampoos in this list, this product contains Aloe Vera, shea butter, and oatmeal. 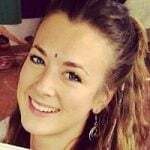 However, the shampoo has been infused with a selection of specially chosen Dead Sea minerals. Overall, this shampoo is great for promoting health, soothing dry skin, as well as calming and relieving itching. 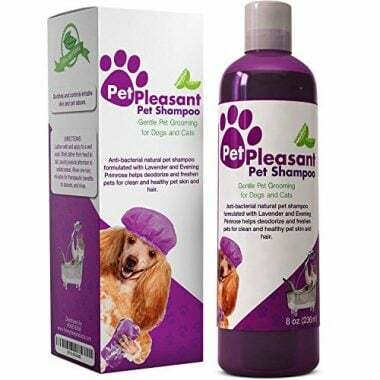 This is another natural pet shampoo product. It features evening primrose and natural lavender, which have deodorising properties and promote moisture. Cold-pressed evening primrose oil enhances your cat’s coat, improving the natural sheen. Coconut oil forms the base of the product, which is rich in antioxidants. 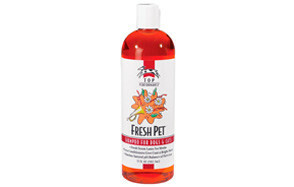 This shampoo has been designed to control pet odours and irritable skin. It offers a gentle yet effective grooming experience. While this may not be a natural option, it incorporates ingredients that are a lot closer to what you would expect when using your own hair. Don’t worry, though; it is formulated for animal use and is completely safe! Some of the key ingredients include keratin, lanolin, and aloe, which help to soothe your cat’s skin and fur. You can use the brand’s colour-coded system to easily find the best products based on the needs of your cat. Finally, we have the Oster Oatmeal Naturals Dander Control Cat Shampoo. This has been especially created to assist with getting rid of excess danger. It is ideal for homes with cat allergies, and it is pH balanced, with no artificial colours. The product is described as 99 per cent natural. 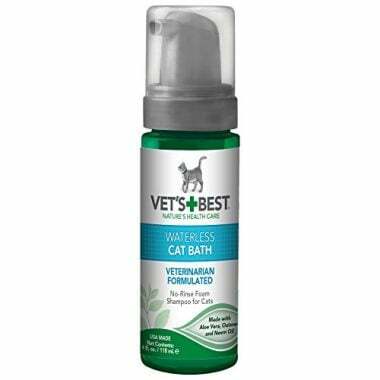 It contains a higher level of active ingredients – surfactants – so that more dirt can be lifted from your cat’s skin and coat. This is a question that a lot of people disagree on. Some people believe that cats do not need baths because they groom themselves. While others admit that they do self-groom, they also think that baths are important nonetheless. Either way, there is no denying that a bath can be beneficial for your cat’s coat and skin. However, this is not to say that your cat is going to enjoy it – they can be notoriously anxious around water – but more on how to contend with that later. There are also some circumstances whereby you should give your cat a bath. The first is obvious: if they end up getting up to something they shouldn’t and they are covered in dirt or some other type of material and their coat is now greasy and dirty. If your cat has something stuck to their paws or their rear, it is time for a bath. You should also give your cat a bath if he has dreadlocks, mats, or other fur problems. Cutting these issues out may seem like a better option. However, that is only a temporary solution, and it does nothing to reduce the chances of the mats coming back again. A clean and healthy coat is the best prevention when it comes to matted fur. Bathing can also help to combat excess hair or shedding hair, which, in turn, prevents hairballs. You should also bathe your cat when they are overweight or older. As cats become older, their fur tends to get a bit greasier – it is part of their natural aging process, and so a little bit of help on your behalf can go a long way. For cats that are overweight, it becomes more difficult for them to groom themselves, as they will struggle to reach every part of their body, which is again where you come in. It is also worth pointing out that there are a number of medical issues that may require you to bathe your cat in a certain type of shampoo, but this is something your vet will discuss with you if applicable. Bathing a cat can be difficult – there is no denying that. However, there are a few things you can do to make it easier. The first is to have a helper. If someone can comfort the cat while you focus on the bathing it will make a massive difference. You should also make sure that you have everything you need within reach, and you should never submerge your cat’s head in the water. In most cases, simply bathing your cat’s body will be sufficient. Cats can get scared if water comes near their face, so if you really do need to wash this part of your cat, you should opt for a damp cloth instead. So, what do you need in order to bathe your cat? Aside from cat shampoo, you will need a small cloth for your cat’s face and cotton balls to clean their ears. You also need a large towel, a gentle spray nozzle for rinsing (or a large pitcher), and rubber gloves. After all, even the most placid feline can scratch while being bathed! Fill the sink until it reaches three inches high maximum. Make sure the water is lukewarm. Wet your cat from the shoulders to the tail. Just like you do when you are washing your own hair, start lathering the shampoo and after this begin rinsing thoroughly. To clean your cat’s head gently, you will now use a washcloth. Clean inside your cat’s ears using a cotton ball. You should never put any type of object in your pet’s ears, including cotton buds. Lift your cat onto a large towel once you have rinsed the shampoo off. Fold the towel around your cat. Dry as much water away from their fur as you can. You may need to use a blow dryer if your cat has long hair. Of course, if the noise scares them, avoid it. Set the blow dryer on low for your first attempt and see how they react. Can I Use Human Shampoo On My Cat? Quite simply, no! You cannot use human shampoo on a cat. This is because of the different pH levels in the shampoo, which makes it unsuitable for your cat’s skin and hair. You need to buy shampoo that has been specially formulated for cats. How Do I Choose The Right Cat Shampoo? Well, now you have a good idea regarding the best cat shampoo options on the market, but how do you choose the best one for you? There are a number of factors to consider. Firstly, as mentioned, you need to make sure that the shampoo has been especially designed for cats. Aside from this, you need to look at the ingredients. The best shampoos are those that are natural. Nevertheless, there will be some cases whereby shampoos with chemicals are required, for example, if your cat has a bad case of fleas. However, in such a circumstance it is better for your vet to advise you on the right cat flea shampoo for your pet. You should stay away from cat shampoos that contain petrochemicals, sulphates, parabens, and artificial dyes. It is also worth considering a specialist shampoo if your cat suffers from any type of skin issue. For example, if your cat has sensitive skin, irritated skin, dandruff, or itchy skin, you need to keep this in mind when shopping. Look for something that has been formulated with skin issues in mind. After all, you need something that is going to be a lot kinder to your cat’s skin. Hopefully, you now have a better understanding regarding the different options that are available to you when shopping for cat shampoo. If you purchase one of the ten products that have been mentioned, you are bound to be happy with the results. As mentioned, while cats do groom themselves, it is also important to give them baths so you can keep on top of their hygiene too.